Total maximum daily loads (TMDL) are essentially a pollution diet for a water body. A TMDL is the amount of pollution that a river or stream can handle before negative impacts occur to water quality. In the case of TMDLs, pollution can come in the form of bacteria, pH, pathogens, or sediment. The Environmental Protection Agency’s TMDL website has a complete listing of pollutants and other information on water impairments across the country. The Virginia Department of Environmental Quality maintains an impaired waters list and is responsible for issuing TMDLs and approving Watershed Implementation Plans (WIPs). WIPs describe the likely sources of pollutants which caused the TMDL to be issued, estimate the existing load of the impairment in the stream, and allocate a load reduction required to restore the health of the stream. Currently only two impaired waters, the Rivanna River and the Chesapeake Bay have TMDLs which impact UVA Both of these waterways are impaired for sediment and the Chesapeake Bay TMDL has additional reduction requirements for phosphorous and nitrogen. Closer to Grounds, TMDLs have been issued for both Meadow Creek and Moore’s Creek X-Trib, which is locally known as Lodge Creek. Both of these streams are impaired for “benthic macroinvertebrate bioassessments.” This means that the water bugs that live in the stream are absent or not thriving due to the quantity of sediment in the stream bed. When there is too much sediment in the stream bed, it fills in the spaces between the bigger rocks where the bugs normally live. These bugs are normally a source of food for fish and other aquatic life, so the overall health of stream depends on these bugs being able to thrive and reproduce. In addition, Meadow Creek is also impaired for bacteria, which can originate from sources such as pet waste and septic systems. 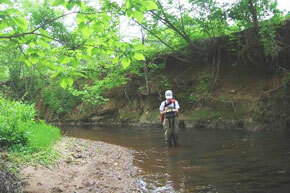 Bacteria in the water makes streams unsafe for fishing, swimming, or other recreational activities. Neither Moore’s Creek X-Trib nor Meadow Creek have approved WIPs plans at this time. UVA will be actively engaged in the development of WIPs for both of these streams. UVA installs best management practices all over grounds to help improve the quality and quantity of the runoff leaving University property. The University undertakes outreach initiatives to educate members of both University and local community on ways they can minimize their impacts on stormwater. UVA partners with the City of Charlottesville, Albemarle County, and others to form the Rivanna Stormwater Education Partnership (RSEP). Together the group joins resources to promote stormwater pollution prevention education in the local area.